Bink HDR is now available! Bink HDR is an implementation of the Bink 2 codec that compresses HDR input data (greater than 8-bit) and then decodes and plays it back into your game's 16-bit frame buffer. 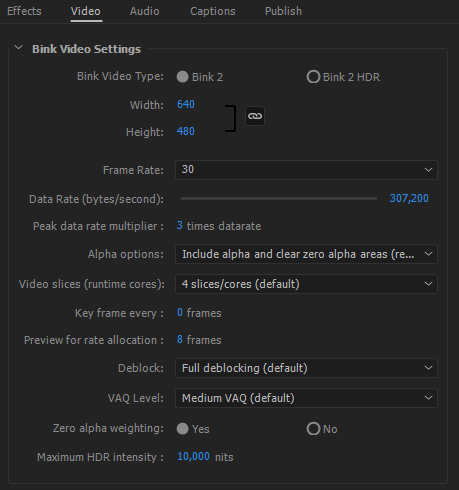 Bink HDR reads OpenEXR files directly with the RAD Video Tools (just like Bink has always worked), or you can use our new Adobe Premiere and Media Encoder plugin to encode HDR input video files directly out of your video editing package! In all other ways, Bink HDR is just like using Bink normally - you get an alpha plane, you get fast playback, you get easy-to-use tools, and you get simple integrations! Call us if you'd like to try an evaluation! What colorspace do you use? Bink HDR uses the new ICtCp colorspace with the SMPTE 2084 perceptual quantizer. Bink HDR and this colorspace combine to give the effective quality of YUV at 11-bits (Rec 2100). We encode from either OpenEXR files or directly from Adobe Premiere as linear float RGBA data, so even if your HDR input files are in another colorspace, we should read them with plenty of precision. Can I use the Bink Premiere plugin for normal Bink videos? Yes, many Bink 2 users will be happy to use the Premiere plugin just to encode normal Bink files. How many nits of brightness do you support? Bink uses a maximum of 10k nits (as in Rec 2100), but you can specify ahead of time that your video only uses, say, 2k nits (say from screen-grabs from your game), and we'll scale the data to make the most of the precision that we have. 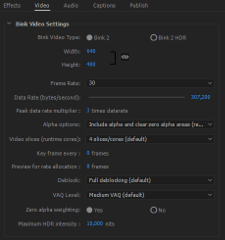 How do I preview the Bink HDR files? Unhandily, the best option to preview HDR is to view it in your HDR game on the device you're developing for. Displaying HDR data on Windows is a bit of a nightmare and requires a ton of tweaky settings that all have to be just right (display settings, GPU settings, TV settings, full-screen mode, the exact right driver, vendor extensions, etc). In the desktop Bink player, we play in non-HDR mode using a simple tonemapper where you can use the up and down arrows to control the exposure. That's the only real option other than a running HDR game. Can I use one set of videos for HDR and normal video? It's totally up to you. Just like the rest of your game, you can run the Bink frames through your game's tonemapper (or use our simple one) and just use one video. Or you can go whole hog and make completely different videos for normal and HDR output. We expect most people to just supply one HDR movie and tonemap for older monitors. How do I integrate it into my HDR game? Super easy - we output scRGB standard 0 to 125.0 HDR pixel values into your HDR frame buffer, and then you can take it from there, just like normal Bink. You can also do minor tonemapping and scaling as we render into your buffer. It's basically just like normal Bink - we give you a pixel shader that converts the colorspace and planes back to simple RGBA floating point values. Do all of Bink's fancy alpha features still work? Yup! The tricky alpha compositing, filling, and weighting have all been updated to work with floating point pixel values. You get all the same alpha compression wins with HDR data. Do you support Unreal and Unity? We support UE4 right now, and are working on Unity. The pixel decoding is completely cross-platform. Pre-compiled pixel shaders are only supplied for D3D9, D3D11, D3D12, Sony PS4 and Microsoft XboxOne. But if your platform has a way to create a high color-depth frame buffer, then you can use Bink HDR there fine. How do I make HDR videos to compress? Adobe Premiere added support for HDR files in late 2016. This support is still improving - eventually HDR will be no more exotic than any other type of video. For now, you might have to experiment with cameras and video formats to build your HDR video pipeline. The most reliable way is to just have Bink HDR compress a series of OpenEXR files - this always works. If you're compressing game capture footage, just use OpenEXR files - very simple. How much bigger are HDR video files? Very close to the same size - we haven't seen an input video that needs much more data rate for HDR. Bink is really easy to evaluate, so if features like these interest you, drop us an email and you can start playing with it today!